By Lucie Pinson, adviser for Friends of the Earth France’s campaign on private finance. Does financing a company active in renewable energy mean supporting the transition to a low carbon economy? Many finance actors would like to answer a simple “yes” to this question, but the reality is not that simple, as many companies demonstrate. The Japanese conglomerate Marubeni is one of them. If the energy transition requires the growth of renewable energy, it also requires a rapid and fair phase-out of fossil fuels. The first without the latter will not get us the massive carbon reduction required to keep global warming well below 2°C and if possible below 1.5°C. And as a matter of fact, some companies are playing on both sides by investing in the development of renewable energy and of the coal sector alike. Marubeni is a great illustration of this phenomenon. With around 10% of its power production generated from coal and six gigawatts of installed coal capacity in 2017, Marubeni would have little difficulty phasing out coal, consistent with the Paris Agreement climate targets. With a similar share of its energy capacity based on renewable energy, and with plenty of experience in the renewable energy sector internationally, the company could even become a world energy leader, according to a new report published this week by the U.S. research organization IEEFA, the Institute for Energy Economics and Financial Analysis. But up to now, investing in new coal facilities is as much part of Marubeni’s business strategy as developing renewable energy, regardless of the fact that these new facilities would contribute to a +4°C trajectory. In 2017, Marubeni was involved in projects totaling more than 13 gigawatts of new coal capacity in nine countries around the globe, many of them with little or no current coal capacity. These countries could benefit from the decreasing price of renewable energies to develop an energy system free of coal and avoid facing the same impacts as coal-dependent countries. But Marubeni’s promotion of coal in these countries is on the contrary helping lock them in to decade of carbon emissions. Going back to our first question in the light of Marubeni’s case, it is clear in our view that financing a company active in renewable energy will only support the Paris Agreement goals provided the company is not developing new coal or other extreme fossil fuel projects, and is committed to phasing out any existing coal activity in line with the Paris targets. According to the International Energy Agency’s “Beyond 2°C Scenario”, not only there is no room for new coal, but all coal power plants need to be decommissioned by 2030 in the European Union and OECD countries and by 2040 in other countries. Despite its coal development plans, Marubeni is still apparently able to rely on big bank support. The company’s main lenders are the Japanese banks Mizuho and MUFG, with the US bank Citi in third place. It is particularly striking to also see French banks such as Crédit Agricole and BNP Paribas also ranking among the Japanese coal developer’s biggest financiers, a position completely inconsistent with their allegedly pro-climate positions. 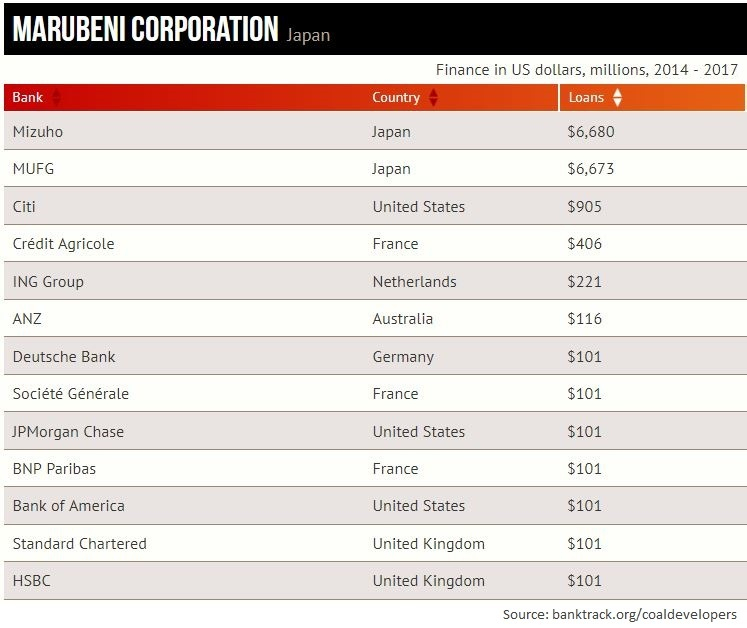 Top Bank Lenders to Marubeni, 2014-17. However other parts of the financial sector are already turning away from the company. In December 2017, AXA became the first finance actor to exclude Marubeni, alongside others, companies based on their expansion plans in the coal sector. Seven other insurers including Allianz and Generali have since announced the exclusion of Marubeni and other coal plant developers from their portfolio. And more may soon follow. In June 2018 a group of 21 Japanese and international environmental NGOs concerned about climate change wrote to 39 major investors and lending institutions (nine of them Japanese), calling on them to divest from Marubeni. Internationally, Marubeni is listed in urgewald’s Coal Plant Developers List which name the 120 companies most responsible for plans to expand the coal power industry worldwide and is increasingly used as a divestment list. We would also expect Marubeni to be among the first coal plant developers to be excluded from financial support from the Dutch bank ING - also a current Marubeni financier - as a result of the bank’s commitment to reduce its coal exposure to ‘close to zero’ by 2025. The wind is turning against Marubeni’s coal activity in Japan as well, as shown by Mizuho Financial Group’s recent statement acknowledging the need for climate action and the role played by coal in global warming. As the IEEFA report states, Marubeni could assert itself as a clean energy leader worldwide if it fully embraces the global transition to clean energy and give up its expansion plans in the coal sector, but as things stand, its plans are creating unnecessary reputational and financial risk for the company. The growing trend of exclusions, beginning in the insurance sector, show this risk is already becoming a reality.